Were you wondering why some of your favorite Latitude 64 players weren’t in attendance at this year’s Ledgestone Open? It’s because they were in Kansas, preparing for the 2018 Pro Masters Worlds. This year, we are proud to have four team members representing us across two divisions and are excited to see how the event unfolds. Before the start of this five-day tournament, players got the chance to test out their skills among a variety of field events. Let’s see what happened there and how day one played out for our team. 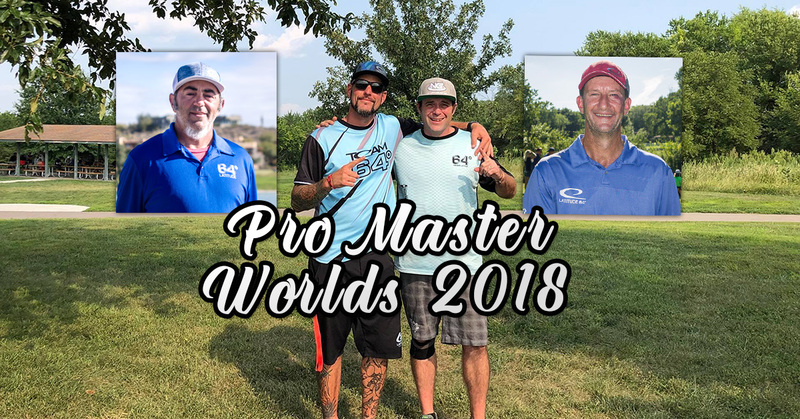 Both David Feldberg and JohnE McCray are competing in the Pro Masters 40+ division, while Patrick Brown and Eric Rainey are setting their sights on finishing strong in the Pro Masters 50+ field. Feldberg decided to start things off right and won the Putting competition against 23 other competitors, and both he and Brown teamed up to win the Doubles Championship. Patrick decided to show everyone that he’s still got it and secured the win in the Long Drive competition within his age-protected division. While these events are certainly fun and allow for friendly competition, there’s something to be said for taking home these accolades before the main event begins. This kind of a mental boost will no doubt fair well for our players. Our players are coming out of the gate strong, with David Feldberg shooting an unofficial 1050-rated round at Bad Rock during Tuesday’s play. He’ll be leading the chase card on Wednesday after a pretty phenomenal round. He carded only one bogey on hole 3 and decided to end his round in style with an eagle on hole 18. He’s currently sitting at 11 down as he heads into day two. JohnE McCray also showed the course who’s boss, as he shot a very similar round to David’s. Carding a bogey on hole 2, he quickly followed it up with an eagle of his own on hole 4 and is now heading into the second round at -10. Sitting atop of the leaderboard for Wednesday’s play is none other than Patrick Brown, who narrowly bested his competition and shot a 9 down at Bad Rock. One double bogey and 11 birdies made up the bulk of his play. Teammate Eric Raney seemed to lose a bit of steam toward the second half of his round, and leaves himself with a bit of work to do as he’s currently sitting at -2. Last year we saw exceptional results at Pro Masters Worlds, with Feldberg placing 3rd, McCray landing in 5th, Brown rounding things out in 8th, and Rainey taking 2nd in Grandmasters. The range of courses that these players are about to encounter over the next handful of days will certainly test their skill sets, mental game, and determination to win. You can follow the action as it happens on the PDGA Live Scoring page and be sure to cheer on our Latitude 64 players who are representing our team. Good luck to everyone that’s competing!